Luxriot is a scalable solutions sizing from a single camera to the thousands of cameras. 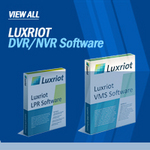 Luxriot is an open architecture Video Management System (VMS). Luxriot accepts MJPEG, MPEG4 and H.264 as well as HD and megapixel video streams from Network (IP) cameras, encoders and video capture boards. Luxriot is integrated with over 2500 devices from all major manufacturers including Axis,Acti, Ganz, Trendnet, SONY, IQinVision, UDP and others. This along with Luxriot client-server architecture allows to build hybrid scalable solutions from a single NVR/DVR to the multiple server system handling thousands of cameras.